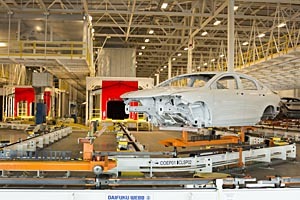 Chrysler’s Sterling Heights Assembly Plant makes the 2015 Chrysler 200. The company recently built a modern paint shop to go along with the existing assembly plant. The paint shop is populated by robots and a few members of the United Auto Workers.